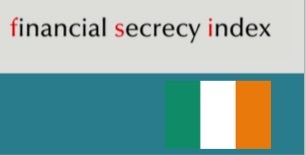 This month we published our fourth Financial Secrecy Index (FSI), complete with a series of reports about each of the biggest tax havens and secrecy jurisdictions, looking into the political and economic histories of how and why they went offshore, who was involved, and where the bodies are buried. The one report that wasn’t ready on publication date last week was Ireland. Now, finally, here it is. It is pasted below – but it’s also available in a prettier pdf version, here. All the individual country reports are available on the FSI website. Ireland is ranked 37th in the 2015 Financial Secrecy index, based on a low secrecy score of 40, one of the lowest in our index, combined with a weighting of just over two percent of the global market for offshore financial services. Yet despite Ireland’s low ranking we have chosen to probe it in detail because offshore financial centres are a political and economic phenomenon that goes far beyond secrecy, and Ireland makes a remarkable case study. Secrecy was never a central part of Ireland’s ‘offshore’ offering. Instead, its offshore financial centre is based on two other key elements. The first, dating from 1956, is a regime of low corporate tax rates, loopholes and laxity designed to encourage transnational businesses to relocate – often only on paper – to Ireland. The second big development has been the Dublin-based International Financial Services Centre (IFSC), a Wild-West, deregulated financial zone set up in 1987 under the “voraciously corrupt” Irish politician Charles Haughey: the IFSC has striven in particular to host risky international ‘shadow banking’ activity and it has posed – and continues to pose – grave threats to global financial stability. Ireland hosts over half of the world’s top 50 banks and half of the top 20 insurance companies; in July 2013 it hosted nearly 14,000 funds (of which 6,000 were Irish-domiciled) administering an estimated €3.7 trillion: up from $840 billion a decade earlier. The Irish Stock Exchange hosts about a quarter of international bonds: Ireland is the domicile for around 50 percent of European ETF assets. In 2014 total IFSC foreign investment at $2.7 trillion in liabilities was equivalent to around 15 times Ireland’s Gross National Product (GNP;) as this report explains, many toxic developments in ‘subprime’ markets that triggered the global financial crisis from 2008 can trace their lineage back to Ireland. Ireland hosts a cottage industry of tax haven deniers: as this report makes clear, it is one of the world’s most important tax havens or offshore financial centres. Contrary to popular mythology, Ireland’s famous and sudden “Celtic Tiger” economic boom from the early 1990s was driven not by Ireland’s corporate tax regime, but by other factors, as this report explains. It was followed by a spectacular, debt-laden bust from 2008 onwards, from which Ireland is only now starting to emerge. For proper context to this report, it is important to explode the Celtic Tiger myth in more detail. Source: Did Ireland’s 12.5 percent corporate tax rate create the Celtic Tiger?, Fools’ Gold blog, March 10, 2015, and associated sources and links. Graph created by John Christensen and Nicholas Shaxson. In short, the tax haven strategy that began in 1956 is now nearly six decades old — and was spectacularly unsuccessful for Ireland for most of that time. Note, too, that Ireland’s famous 12.5 percent corporate tax rate was in fact a tax rate increase. What triggered the Celtic Tiger era above all was Ireland’s accession to the EU single market in 1993 – plus several other factors. There are of course important nuances in this basic story. On one level, this is a fairly straightforward tale about corporate taxes, financial deregulation and their local economic impacts. But on another level this is an Irish version of a phenomenon we’ve encountered across the tax haven world: the state ‘captured’ by offshore financial services. Before exploring this peculiar story of nepotism and hubris, however, it is worth providing more context for the Celtic Tiger. As mentioned, it was EU single market accession that was the big factor. But there were of course several other crucial ingredients. One was the fact that Ireland had a skilled (and, crucially, English-speaking) and educated workforce – many educated by the UK and other countries during earlier periods of mass Irish emigration – plus membership of the Euro currency from 1999, not to mention a worldwide boom in global FDI flows at the time. Inward FDI flows responded massively to all these factors: rising from 2.2% of GDP in 1990 to an astonishing 49.2% in 2000. Boosting the Irish economy further, European agricultural spending on the country rose from just €500m in 1980 to €2bn annually on average from 1990-2010. 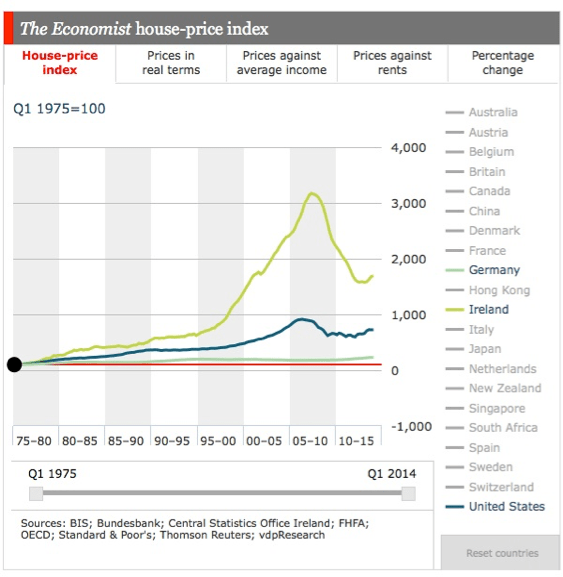 Yet the next graph illustrates what was most likely the boom’s biggest driver: soaring property prices. The fact that this looks so similar to our first graph in scale and timing is no coincidence: this was, once again, largely the result of Ireland’s accession to the EU single market, which massively boosted housing finance, creating a vast pool of available wholesale funding with exchange-rate risks removed. Irish people only understood how ephemeral a lot of this ‘growth’ was when crisis hit. It is true that the tax offering did help attract large amounts of investment, particularly from U.S. multinationals – and European membership helped keep Ireland off tax haven blacklists that apply to classic tax havens such as Cayman and Bermuda; a broad network of tax treaties with other jurisdictions complement this. However, the story does not end there. The FDI benefits to Ireland may have been offset by the scale of the tax giveaway involved, and these benefits also have accrued to a relatively small segment of Irish society. What is more, Ireland has triggered ‘beggar my neighbour’ competition from other nations, meaning it has to constantly offer new and larger subsidies to mobile capital, just to keep up. It’s also always important to stress that what we’ve described in this section are simply the costs and benefits to Ireland: the corporate tax haven strategy (and the financial centre strategy, below) have transmitted harmful spillover effects onto other countries, notably the U.S. which has seen Ireland help facilitate a massive transfer of wealth from ordinary taxpayers to mostly wealthy shareholders. The Irish corporate tax haven strategy took its first steps in 1956 with the Export Profits Tax Relief (EPTR) which entirely exempted manufactured export goods from corporate income and profits tax. This was pushed through by John Costello, the Irish Taoiseach (head of government) in October 1956, who failed even to discuss the measure with other members of the government, and in the face of objections from the Irish Revenue – relying instead (p6) on advice from his son-in law Alexis Fitzgerald and other personal advisers. The ‘captured state,’ with its incestuous links among political and economic insiders and absence of democratic debate, was evident from the outset. 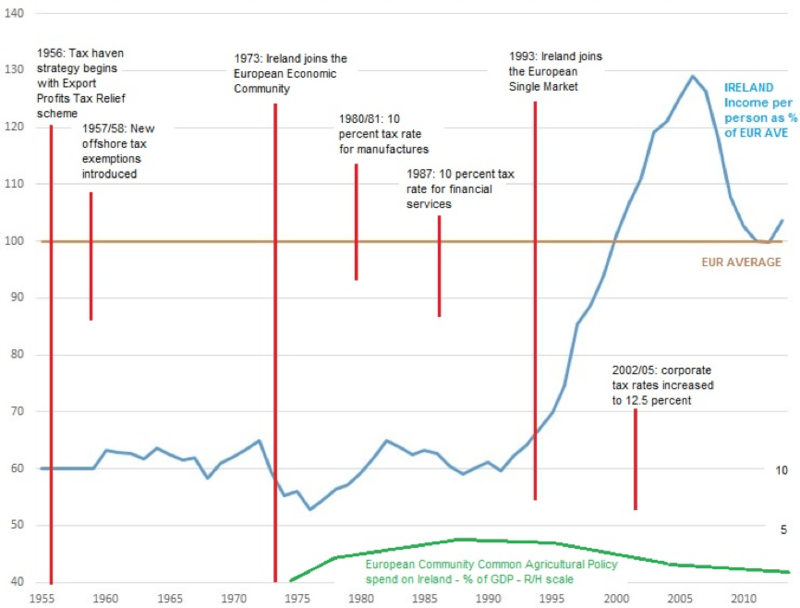 While these antics attracted some investment and profit-shifting to Ireland, the graph above shows that they failed to deliver economy-wide benefits And, as Ireland negotiated entry into the European Economic Community (EEC) in 1973 it suffered a setback when it was told that these tax measures were discriminatory. The terms of Irish accession to the EEC allowed plenty of time to adapt, however, and Ireland responded by replacing the differential tax system with a single, across-the-board tax rate of 10 percent to apply equally to all industrial sectors. Implementation of this single rate was delayed until 1981, however, and other sectors such as tourism, facing corporate tax rates of 40 percent, began to lobby hard to obtain the same low tax rate. Finally, in 1997 it was announced that Ireland would from 2003 introduce a 12.5 percent tax rate and expand its application to all trading companies, with non-trading income taxed at 25 percent. This happened over a decade after the “Celtic Tiger” awoke. The “Double Irish” scheme relied on two Irish-incorporated companies: the first, taxable in Ireland, collects profits (say, from operations in Europe) but wipes them out by paying royalties to a second Irish-incorporated company tax resident in another tax haven like Bermuda or Cayman, which won’t tax them. In 2014 the Irish government, under international pressure, said it would phase out the Double Irish; new schemes are already in development. A U.S. Senate investigation in 2013 found that the U.S. technology firm Apple had used the Double Irish in what U.S. Senator Carl Levin called the “holy grail of tax avoidance. . . magically, it’s neither here nor there”. These Irish-based entities were not taxable anywhere, enabling Apple to pay no tax on the lion’s share of its offshore profits. Citizens for Tax Justice in the U.S. estimated in 2015 that Apple would owe nearly $60 billion in U.S. taxes if it hadn’t stashed its profits offshore. An Irish subsidiary at the heart of Facebook’s tax affairs funneled profits of €1.75 billion in 2012 to a pre-tax loss of €626,000 by paying mighty ‘expenses’ to another Irish Facebook subsidiary tax resident in Cayman. Similarly, Google escaped $2 billion a year in taxes using a “Double Irish” scheme via the Netherlands and Bermuda. Ireland’s 12.5 percent corporation tax rate is well known, but less has been written about its role in providing prolific tax loopholes: a far more important offering for many large multinationals. The key for multinationals is to make sure that the lion’s share of profits can escape that 12.5 percent tax rate by being shifted to a tax haven (or nowhere – see the Box) where they get taxed lightly or not at all. Ireland makes this particularly easy to do, not only because of the general laxity of its tax administration, but more specifically via transfer pricing tricks. Astonishingly, until 2010 Ireland had no meaningful transfer pricing legislation, allowing something of a Wild West free-for-all, which has since only been tightened up a little. This lax regime produced infamous wheezes such as the “Double Irish” tax scheme operated by the U.S. tech firms Facebook, Apple and Google (see p5, here.) All ) which have, as the graphic below illustrates, led to extremely low effective tax rates in Ireland for US multinationals. The second main leg in Ireland’s ‘offshore’ offer came with the birth of the Irish Financial Services Centre. Yet within a decade the concept had been revived, and was pushed aggressively through by a tiny group of insiders with little democratic consultation. The biggest early driver of the IFSC project was the (now billionaire) stockbroker Dermot Desmond, formerly of Citibank and PricewaterhouseCoopers, who put forward the idea to a few key individuals at a meeting in Kitty O’Shea’s pub in Dublin. In 1985 he formally proposed the idea of a financial centre in Dublin to the government. Desmond’s stockbroking firm part-financed the full-scale feasibility study by PWC, and he also owned some of the original buildings that were later designated to the IFSC project. He then got together with stockbroker Michael Buckley, later to become Chief Executive of Allied Irish Bank, to co-write the relevant section of the manifesto for the dominant political party, Fianna Fáil, during the 1987 election campaign, with a promise of 7,500 full-time jobs within five years. Fianna Fáil was led by Desmond’s friend, the politician Charles Haughey (see box), and although the document asserted (p318) that it was “not oriented in any way towards the creation of a tax haven,” they all knew that the truth would be the opposite. Haughey was returned as Taoiseach (head of government) in March 1987, and within two months the government had chosen the Custom House Dock site in Dublin to host the IFSC. The “voraciously corrupt” Charles Haughey was Irish Taoiseach (prime minister) for most of the time between 1979 and 1992, roughly at the same time as Margaret Thatcher in the UK. Haughey’s rabidly complex financial affairs are laid bare here. “Within the public service, new initiatives tend to develop slowly. These are advanced, after much consultation, and refined, usually by committees. So before a policy proposal finally emerges as government policy, it must survive a high degree of scrutiny via checks and balances. Tax incentives were created for the IFSC to compete with nearby banking centres such as Luxembourg and the Channel Islands, including a tax rate of 10 percent for licensed companies. A raft of laws and rules, notable for their laxity, were crafted to attract global money management, foreign currency dealing, equity and bond dealing, and insurance – and the finance minister was given leeway to allow services “similar to or ancillary to those” – a very broad net. The laws were fully in place within just three months of the new government being formed, once again highlighting how normal processes of scrutiny had been discarded. Perhaps the only detailed academic examination of Ireland’s regulatory laxity comes from Professor Jim Stewart of Trinity College, Dublin. The IFSC, he reveals, formed a core element in the toxic global “shadow banking” system that led to the global financial crisis. For example, hedge funds would typically be listed in Dublin, managed in London and domiciled in a classic tax haven like the Cayman Islands. When the global financial crisis hit, many Dublin-listed structures collapsed. Germany’s Sachsen Bank, IKB, West LB and Hypo, for instance, required massive state aid after luxuriating in Dublin’s regulatory permissiveness. Hypo Bank was bailed out with €102 billion in German state loans and guarantees after it took over Ireland-registered Depfa Bank based in Dublin. In 2006 Depfa, which had a tiny sliver of just €2.98 billion in equity bootstrapping nearly €223 billion in gross assets, collapsed when its Irish subsidiary could not secure short-term funding. Later, the head of the German financial regulator Bafin said that the rescue of Hypo had “prevented a run on German banks and the collapse of the European finance system.” A Bear Stearns holding company, Bear Stearns Ireland Ltd., was similarly leveraged, with a ratio of one dollar of equity underpinning $119 in gross assets. Even so, almost no analyses of this and other episodes involving the likes of Lehman Brothers, AIG and others, has investigated the core role that Dublin played in the problems which subsequently emerged. Ireland, it seems, had not been interested in tackling or even investigating the dangers. The Irish financial regulator has been quoted as saying that it had no responsibility for such entities: its remit extended only to banks headquartered in Ireland. If the relevant documents were provided to the regulator by 3 p.m., Stewart noted, a fund would be authorised by start of business the next day (a prospectus can run to 200 or more pages; it can hardly be assessed between 3 pm and the close of business at 5 pm.!) Even years after the global financial crisis, Ireland’s regulator says that financial-vehicle corporations such as those that helped bring Depfa down are not regulated: its role, it says, is to regulate firms but not specific financial products, and in 2013 it was reported that only two employees at the Central Bank oversee the entire trillion-dollar industry. Again, this denial of responsibility is a classic and deliberate “offshore” strategy. This history constantly provides reminders of how Ireland shows all the symptoms of the ‘financially captured state,’ a phenomenon we’ve described in so many of our narrative reports on tax havens and secrecy jurisdictions, and in our Finance Curse literature. This involves nepotistic and often corrupt links between business and politics and a deference to offshore financial services and a society-wide consensus supporting the system. Since 1956, corporate tax and financial policies have since 1956 been crafted with little or no democratic consultation by affected populations, and instead by small groups of officials often operating in secret, collaborating closely with global offshore financial sector interests, and frequently leading to corrupt and insider dealing at the expense of the rest of the population. These insiders successfully ring-fence the sector against local democratic politics, and intimidate tax authorities and regulators into giving them more or less free rein. “Feargal O’Rourke, the scion of a political dynasty who heads the tax practice at PricewaterhouseCoopers in Ireland. . . . He persuaded regulators to eliminate a withholding tax on profits that corporations move out of the country — while separately advising his cousin who was finance minister. The willingness to brush dirt under the carpet to support the financial sector, and an equating of these policies with patriotism (sometimes known in Ireland as the Green Jersey agenda,) contributed to the remarkable regulatory laxity with massive impacts in other nations (as well as in Ireland itself) as global financial firms sought an escape from financial regulation in Dublin. ‘They met under the auspices of the “Clearing House”, a secretive group of financial industry executives, accountants and public servants formed in 1987 to promote Dublin as a financial hub. . . . The participants thrashed out 21 separate taxation and legal incentives sought by the financial industry at the meeting, which took place in room 308 in the prime ministers’ offices. . . .
A September 2013 editorial by the Irish political magazine The Village highlights how the offshore financial consensus continued to pervade politics thereafter. “The bailout treated the sick patient but didn’t tackle the underlying issues of political reform, a failure to listen to criticism and a reluctance to look elsewhere for advice. . . These factors were at the root cause of the financial crisis and the previous Irish fiscal crisis in the 1980s. Unless we think about this now it could happen again in 15 years’ time”. Did Ireland’s 12.5 percent corporate tax rate create the Celtic Tiger? Fools’ Gold Blog / Naked Capitalism, March 10, 2015. Shadow Regulation and the Shadow Banking System: the role of the Dublin International Financial Services Centre, Tax Justice Focus, Vol. 4 Number 2, 2008. Jim Stewart’s article provides a much shorter summary of his subsequent paper. The International Financial Services Centre: a National Development Dream, Padraic White, 2000. An uncritical yet informative chapter in the book The Making of the Celtic Tiger: the inside story of Ireland’s boom economy, by Ray MacSharry, Padraic White, 2000. With thanks to Jim Stewart, Sheila Killian and Tom McDonnell for their help with this article. The term “shadow banking” is attributed to the U.S. financier Paul McCulley, who described it as “the whole alphabet soup of levered up non-bank investment conduits, vehicles, and structures.” It generally refers to banking activity that lies outside the purview of normal banking regulations. Bono’s comment came in response to criticism of him for calling for more tax-financed foreign aid while his band U2 had been benefiting from various artificial tax-dodging arrangements. See Did Ireland’s 12.5 percent corporate tax rate create the Celtic Tiger? Fools’ Gold Blog / Naked Capitalism, March 2015, and associated sources on agricultural subsidies. For example, Liechtenstein announced plans for a 12.5% across-the-board corporation tax rate, explicitly to match Ireland’s. The United Kingdom has more recently been offering competing tax products. PwC described the situation as “the absence of local regulations and scrutiny prior to the 2010 Finance Act.” The changes in 2010 do not apply to investors already in Ireland; and they are restricted to those profits that are subject to Ireland’s 12.5 percent tax rate. There has been plenty of myth-making in Ireland about the corporate tax rate. Studies cited by the Irish Times and others suggest that the effective tax rate is close to the headline 12.5 percent rate. But this is a fictional result based on a widely derided result obtained by PWC, theoretical ‘standard firm with 60 employees which makes ceramic flower pots and has no exports: it is entirely inapplicable to transnationals. See PwC/World Bank Report ‘Paying Taxes 2014’: An Assessment, Jim Stewart, IIIS Discussion Paper No. 442, Feb 2014. Though there are various ways to calculate effective tax rates, studies find rates of just 2.5-4.5 percent. The Making of the Celtic Tiger: the inside story of Ireland’s boom economy, by Ray MacSharry, Padraic White, 2000. Our “Finance Curse” document explores this ‘capture’ as a widespread phenomenon of tax havens and large financial centres.